As a home or business owner, there are many different things you must worry about daily. There is no need for an insect or rodent infestation to be one of them. If you need to have pest control in Blackstone, MA done, D&T Pest and Termite Control Inc. can set you up with the specific pest control services you require. From mice treatment and bedbug treatment to termite control and squirrel removal, D&T Pest and Termite Control Inc. is the family owned and operated company you can trust to take care of almost any pest problem. With more than two decades’ worth of experience in the pest control industry, D&T Pest and Termite Control Inc. is highly skilled when it comes to carrying out pest control in Blackstone and the surrounding areas. A pest control specialist from D&T Pest and Termite Control Inc. can create a game plan after examining your pest problem and carry it out until your problem is completely gone. With a combination of training, experience, and expertise, the specialist can conduct mice treatment, ant control, bee removal, bat removal, mosquito treatment, and any other services you might need. D&T Pest and Termite Control Inc. knows how tough it can be for the average home or business owner to deal with insects and rodents in their homes or businesses. Pests can damage structures, put people’s health at risk, and cause a general nuisance. It’s why you should consider calling on the fully licensed and insured D&T Pest and Termite Control Inc. the next time you spot pests inside or outside your property. You’ll get immediate access to services like termite control, bee removal, bat removal, ant control, and even mosquito treatment and tick treatment. 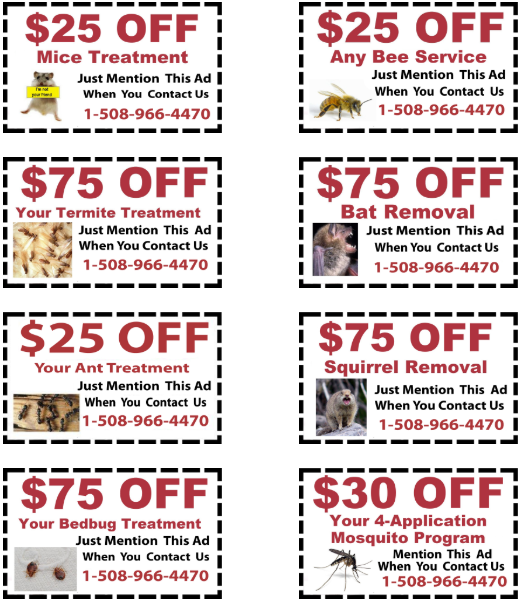 Contact D&T Pest and Termite Control Inc. at 508-966-4470 to obtain pest control in Blackstone, MA.